"HE HURLED THE LANCE THAT SMASHED CUSTER THAT HISTORIC DAY AT LITTLE BIG HORN!" The Lakota tribes are scattered but a dying chief predicts that one day a warrior will unite them against the white invaders. 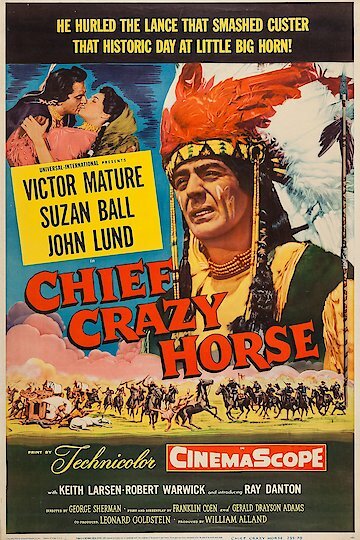 A boy named Crazy Horse believes that the prophecy is about him. After fighting with Crazy Horse over a woman, a warrior named Little Big Man goes to Fort Laramie and reveals the presence of gold in the Black Hills. The whites decide to survey the Indian burial grounds and discover rich gold fields. War begins between the whites and Lakotas. Crazy Horse teaches new tactics to his braves and refuses to trust a treaty with the soldiers.